Even though the Bhagavad-gita is considered the most basic book of Vedic knowledge its contents still amaze the minds of readers from various backgrounds. Somehow this book has the ability to touch the lives and engage the minds of readers casual, serious or spiritual. 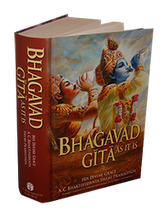 Bhagavad-gita As It Is, published by our organisation with translation and commentary by A.C. Bhaktivedanta Swami Prabhupada, has grown to become the most respected, widely read and most widely distributed edition of the Gita to date. It often sits as a standard book of reference in many Indology courses in reputable universities throughout the world and no other edition has been translated into as many languages. What follows is a humble attempt to bring together some insights in the form of a short overview of the Bhagavad-gita. The aim is not to draw out every single philosophical point, but rather to highlight key concepts in each chapter. Hopefully this overview will assist readers in understanding the flow, context and practical application of these timeless spiritual teachings. It may also assist teachers of the Bhagavad-gita in their attempts to share this wisdom with others. This summary is based on the Bhagavad-gita As It Is, translated by A.C. Bhaktivedanta Swami Prabhupada. His translation has revolutionised modern thinking, and each purport elucidates the incredibly profound life lessons that Lord Krishna imparts to Arjuna. We hope this attempt to share some of that wisdom will inspire the reader to study Srila Prabhupada’s full translation which can answer every question, remove every doubt, and ultimately bring one face-to-face with Krishna, the Supreme Personality of Godhead. Acknowledgement: This summary is taken from the small booklet entitled: Bhagavad-gita – A short Summary in Acronyms. It was written by His Grace Sutapa dasa, a resident brahmachari of the Bhaktivedanta Manor in England. It has been used with his permission. Use the links below to view the summary.